I know what feels right for me in parenting. I know that I want connection and that respect works both ways. I know that punishing a child isn’t the way to help them learn about the world around them. And that praising them unnecessarily isn’t helpful in the long run either. Yet I’ve find, more often than I would like, that I’m fighting with habits and conditioning. More often than not modern gentle parents have been raised by parents who were more authoritarian, given the time they were bought up. So we have an internal conflict of what we feel is right versus what crops up in those heated moments. So many of the issues surrounding parenting and children is centered around respect. Or moreso, a lack thereof. Children often aren’t fully viewed as people worthy of connection and respect. So when I’m respecting my child’s needs, giving them choices, helping them with transitions, understanding that they need me, helping them deal with big emotions, and not rewarding/punishing them as a means to get them to ‘obey’… I’m viewed as naive or crazy. But, I’m right to question this. And so are you. You’re right to challenge the norm and consider the road less taken. Cognitive dissonance is that uncomfortable feeling that you get when confronted by something new that makes sense but challenges you. Pushing past that discomfort is hard, but I am so freaking glad I did (and will continue to) time and time again! When faced with strong emotions from a toddler or a defiant four year old, my instinct is sometimes to make it all better. This is just as unhelpful as a temper. I have to consciously be mindful of my choices and their implications. This is particularly true when parenting in public around those who parent differently. It’s like I have the potential to turn into another mama sometimes. Earlier on in my parenting journey, I struggled with what felt right versus what everyone else was doing. I was new to parenting, maybe they knew better? Maybe the thought that children could be respected and firm boundaries could be enforced without punishment (physical or emotional) was too idealistic? Either way, I made some regrettable decisions in an attempt to conform. I tried punishing Cameron a few times as a toddler despite it leaving a bad taste in my mouth. Not to mention the fact that it never worked and only made us more upset and affected our connection. I tried to conform because it seemed easier than doing something that very few others were doing around me. Yet it never sat well with me, and thankfully I gave up pretty readily. However, it’s still taken years to sit comfortably enough to not care about judgment. Don’t conform for the mere fact that you feel alone in your decision. Don’t conform because everyone else is doing it. Don’t conform because it’s easier than defending differences. I promise you that trusting your instincts – whatever they may be – will feel better in the long run. These instincts are the one’s that may be separate from your upbringing and you just know are right. But that initial leap to ignore the ever-present thoughts of ‘mainstream parents’ is hard. Because sometimes they’re close to home. Sometimes they’re from a concerned spouse or a close relative, even a bunch of well-meaning friends. Every parent wants to do the best by their children. Every parent doesn’t want to do something that could be potentially damaging to their children. So the doubt can creep in if you hear enough of the same thing. But I promise you that you’re not going to regret connecting with your children. You’re not going to regret taking that deep breath and meeting big emotions with compassion and guidance. You’re not going to regret respecting your child. Parenting consciously can be hard. Not only because of working against those habits and conditioning, but because we have our own emotions to contend with. It’s all a learning curve and your children don’t need perfection. They need intention. I think it’s so important to live according to your own ideals. It’s so freeing to stand for what really matters to you. I can’t imagine ever regretting parenting how I think is best, but I definitely could regret not being brave enough to make my own path! Your children need you. They need their caring parent who takes the time to respect them and to acknowledge their feelings. They need someone who tries their damned hardest to be mindful and who recognises their mistakes. They just need you. Imperfectly perfect, learning alongside them and helping them to understand the world around them. A Love Letter to Mindful Parents of Little Ones – inspiring words from a mindful parent whose children are now teens. 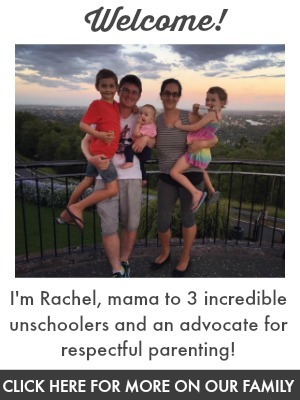 Respectful Parenting – It’s Weird, But It Works! What are some of the most poignant and formative books you’ve read about parenting philosophy and unschooling?